I was able to make some time to work on painting my first ever chaos model! He still has a lot of work until he's finished, but should be done in time to enter it in the painting/converting competition being run over at Standard Template Construct right now with two $50 gift cards to Secret Weapon Miniatures as the prize! I know it's late notice, but if anyone is painting up a non-vehicle chaos model, you should enter too. There is also another competition going on at the Chaos Manifesto which is giving out gift cards to Games Workshop based on how many people join up. So go check out the competitions and win some stuff! 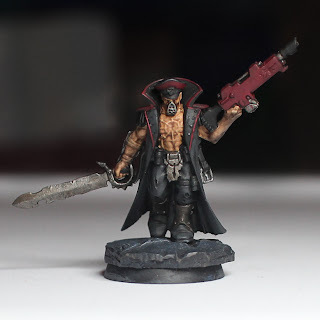 Check out the Cultist Conversion Part 1 to see what he looked like before paint, and also see a few other cultists I'm working on. I already like how menacing he looks. Thanks! My wife says he looks like Bane from the Dark Knight Rises. Hopefully I can keep the menacing look to him. All this competition is making me excited! Really good looking skin tones! Can you do a rundown or just paints used? Thanks. The skin is just GW Kislev Flesh (about a million thin coats to get it smooth) with a wash of GW Agrax Earthshade. I'm planning on going back with more highlights and washes next. The Red is just Khorne Red now, but it will get some highlight next. I'll probably give a more detailed rundown when he's all finished since I'm not really sure what paints I'll use next. Thanks! I guess agrax does the work I was looking for...maybe I'll give it a try! For what to do next I'd use some nuln oil to shade the red on the gun(also works well with metallics). If you're interested, check out the next post. I improved the skin a bit by adding some more highlights with kislev flesh and going over the whole thing one more time with thinned earthshade(focusing on the deep areas). And I actually used agrax earthshade for the gun and did highlights with wazdakka red.